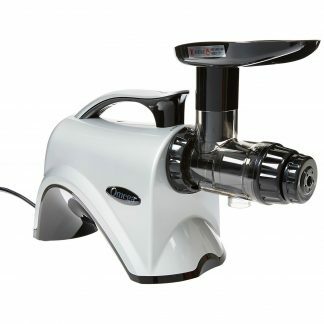 The Alpha H-AI juicer features a self-feeding hopper that will chop and push down ingredients for you. Juices fruits, cruciferous vegetables, leafy greens, nuts and soybeans to create nutritious cold-pressed juices, milk, tofu, ice cream and more. Slow Squeeze Technology: The HZ slow juicer rotates at a speed of just 43 revolutions per minute to mimic the motion of hand squeezing juice. 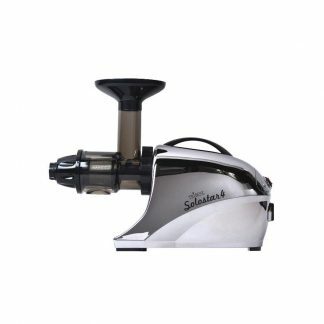 Yield: Unique low-speed auger squeezes every drop of juice, resulting in bone-dry pulp. Works Quietly: A near-silent AC motor. The H-AI Slow Juicer is the first ever self-feeding juicer released in US & Canada. Cased in a sleek matte finish, the H-AI’s Alpha Technology features optimized juicing, easier cleaning, and two hoppers to meet all of your juicing needs. 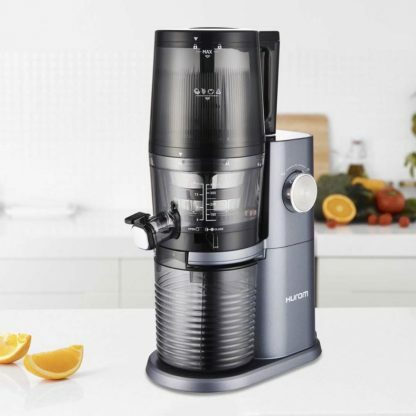 With the smart design that comes in Silver, Rose Gold, or Slate Blue, the H-AI will be a serious upgrade to your juicing game. Self-Feeding Hopper: The automatic blade inside the self-feeding hopper will chop and push down ingredients for you. When you’re making nut milks — or if you’d rather put in ingredients by yourself — use the regular Alpha hopper for the best juicing experience. Pulp Outlet: Pulp is discharged vertically so that the pulp container directly beneath the chamber will collect it. This user-friendly design helps you save much counter space. Slow Squeeze Technology: The H-AI slow juicer rotates at a speed of just 60 revolutions per minute to mimic the motion of a hand squeezing juice. This patented Slow Squeeze Technology ensures your juice stays fresh and in its most natural state. Taste & Pulp Control: We’ve spent decades perfecting our juicers for taste. Juice created with a Hurom slow juicer is fresh, unprocessed and pure. The H-AI Slow Juicer also comes with a control lever and a fine and coarse strainer that allow you to control the amount of pulp to suit your taste. Easy to Clean: During juicing, the inner spinning brush rotates to clean the chamber and strainer simultaneously, reducing clogging and increasing juicing efficiency. The H-AI Slow Juicer can also be quickly disassembled and assembled, making cleaning a breeze. Versatility: Works wonderfully on fruits, cruciferous vegetables, leafy greens, nuts and soybeans to create nutritious cold-pressed juices, smoothies, nut milks, and more. 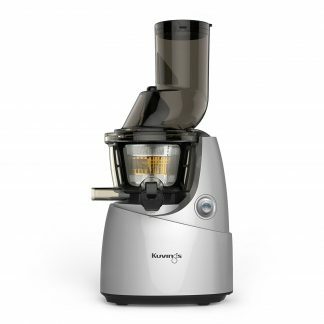 Works Quietly: A near-silent AC motor works efficiently using just 200 watts of power which means you can enjoy cold-pressed juice at home without the noise caused by traditional juicers and blenders. First-timer friendly I was addicted to commercialized juices. I saw this Hurom AI from a friend's house and decided to take the leap and get myself one. Risky as it maybe to spend $699 on something fairly new to me is a blunt way of calling it. I just couldn't wait to unbox as soon as FedEx was by the door. The manual really helped in easing up the assembly. I ran to Kroger's as fast as I could to get fresh produce and try it out. Juicing never felt as easy as this. Cleaning is definitely something even my 10 year old wouldn't complain about. What else is better than a self feeding hooper?! I consider preparing the fruits I would juice to be relaxing. Afterwards, just throw what you want inside the chute and let it do its magic.